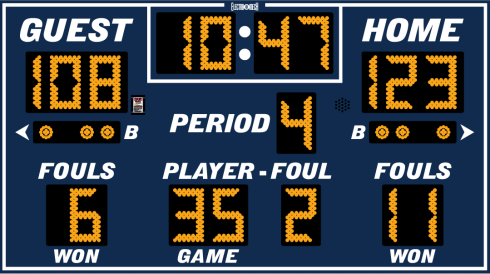 This 9 ft. x 5 ft. scoreboard is not one our biggest in size, but it is big on features. Perhaps most important among these features is the rugged design that you find across our line of outdoor products. And, like our indoor basketball models, the LX7260 uses Electro-Mech's intuitive but flexible MP console design. All the digits are 11-inches tall and available in either red or amber. In addition to Time, Period, and Scores, we have digits to show the Total Fouls for each team along with Player Number and Foul Count for the person who committed the most recent Foul.